The BBC commissioned a new series of Radio Ballads – inspired by the ground-breaking programmes by Ewan MacColl and Charles Parker of the 1950s and 60s – in 2005, and the pilot programme, The Song of Steel, was written and produced by John Tams and John Leonard in that year. Jez Lowe was invited to participate in the second programme, The Ballad of The Big Ships, and soon became one of the long-term principal writers for all the subsequent series. There were six programmes in the first series, followed by a one-off, The Ballad of the Miners Strike in 2010, then six programmes to coincide with the London hosting of the Olympic Games in 2012, and then five for The Ballad of The Great War, starting in 2014. Another “ballad” production, The Ballad of Child Migration, was turned down by the BBC, but was then adopted by London’s Victoria and Albert Museum to coincide with an exhibition they were promoting in 2015, and live performances of this, featuring most of the Radio Ballads team, including Jez, are an on-going project, most recently at the 2017 BBC Folk Awards show. More performances are expected in 2018. Jez often refers to “the seventy-odd songs I’ve done for the Radio Ballads”, but in fact there’s somewhat less than that, a mere 58 at last count! Some of these songs have been released by Jez commercially, often in re-written or embellished form, but most have not. One or two have been released by others, notably The Unthanks, who covered the song MONKEY DUNG MAN on an album, a few years ago. One song, OLD HAMMERHEAD, was an older composition used in the shipbuilding programme, and at least three of the songs submitted for inclusion ended up not being used at all. At time of writing, two of the Great war programmes have yet to be broadcast, so it’s not yet known if all the songs written for this series will be included. 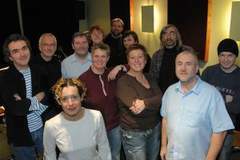 The songs for the series, as broadcast, have all been recorded by Andy Seward at his studio in South Yorkshire, with the same team of musicians, including John McCusker, Andy Cutting and latterly Michael McGoldrick. However, Jez actually recorded demos of each song prior to this, and all of these are still in existence. Indeed, there was talk of them being released in their entirety at one point as a double CD collection. Instead Jez re-wrote and/or re-recorded selected tracks for his last album, The Ballad Beyond. The entire set of Jez Lowe Radio Ballads songs, the original “tapes” of which are no doubt safely in Jez’s possession, are also currently “housed” in an on-line drop-box for access by the BBC team. Having been granted access also, we can tell you that they make interesting listening. They are not mere “roughs” as one would expect. In fact they are all professionally recorded, multi-tracked versions, with backing on guitar, piano, cittern, accordion, mandolin, and occasional fiddle, with harmony chorus often added. The songs are complete, without the cuts and edits and narrative sections that feature on the radio broadcasts. Many are the original versions of the songs later re-worked for Jez’s own use, so often have very different lyrics, alternative melodies and very different arrangements. Most are solo, multi-tracked recordings, but occasionally other musicians (Bad Pennies perhaps?) are evident. And of course, Jez takes lead-vocals on all of them, unlike on the broadcast versions. So, here’s a full list of known songs, in the knowledge that the recordings themselves are unlikely to be made public any time soon. (Songs marked * are unused) The photo shows the Radio Ballads cast prior to a live performance at Celtic Connections in 2008.